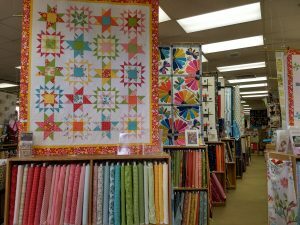 While in Missouri, we made a couple of stops at quilt shops in the St. Louis area. The first one was Jackman’s Fabrics (pictured on the left) which is actually in St. Louis. It is a huge shop that carries sewing machines and home decorating fabrics in addition to its very large selection of quilting fabrics. The shop has a lot of quilts on display and just going in for inspiration is worth the trip. 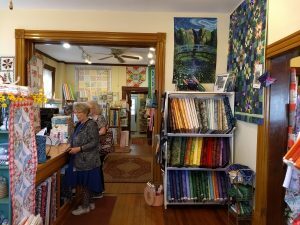 I found the prices to be a little higher than those in the smaller quilt shops in the more rural areas of Missouri, but that is to be expected as I’m sure their overhead is much higher. One of my favorite St. Louis area shops was Quilted Cottage (pictured on the right) in St. Charles just west of St. Louis. It is on a picturesque brick street surrounded by gift shops and restaurants. The quilt shop is in an old house. They carried a large selection of Civil War fabrics and displayed their fat quarters so nicely that I kept fondling them and picking up more. We liked the shop so much that we stopped in again when we returned to St. Louis to fly back home.